YOUR BOBBIN RUNS OUT OF THREAD! The words that come after the bobbin thread is gone are usually not the ones we are most proud of saying. I am very lucky that Tara is not a judgmental dog. Some machines do feature a sensor that tells you well in advance when the bobbin will be running out, but the real thrill sewers among us still like to push those limits to see exactly how much further we can go before it is serious. By then, it is too late! 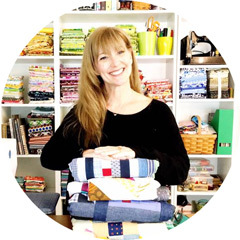 You are in the middle of the quilt, no bobbin thread and of course it was the MOST INCREDIBLE free motion quilting that has ever been achieved by human hands on a domestic home machine. It is enough to make a grown quilter cry. 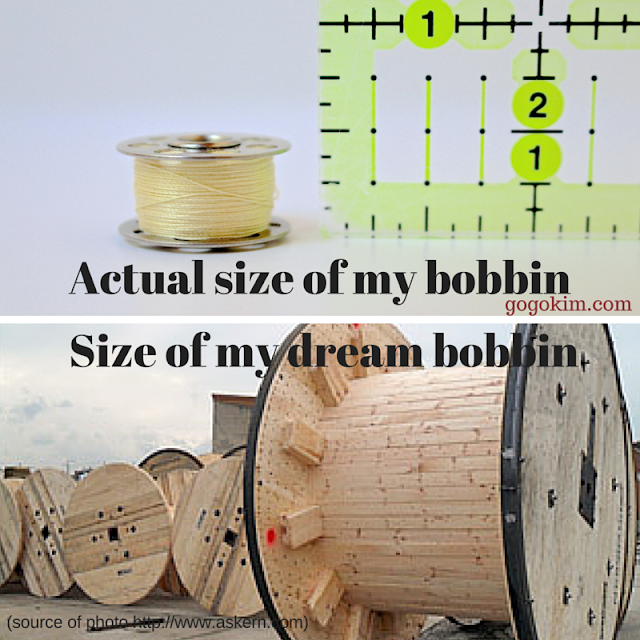 I propose companies design bigger bobbins thereby creating happier quilters! Here is an idea of what I think a decent sized bobbin would look like for my machine! When it comes to bobbins... SIZE MATTERS! I totally agree with you ..but I think the sewing machine companies should forgo the bobbins and just let us use a spool of cotton instead. Note to Rie......some machines DO use a thread cone for the bobbin thread, but no DSM to my knowledge.... My Ms Sweetie lets me know by letting me hear a slight rattle coming from the bobbin area (that is, IF I'm listening!!!!!!!!!!!!!). Running out of bobbin thread is the worst! I'm trying to get better at preparing extras before hand, but that's yet to happen!